Castel Church sits on an elevated site in just about the centre of the island (and right at the edge of Castel parish). Many people do not even realise that one of the finest examples in the world of an early statue-menhir, maybe representing the Mother Goddess, is looking over them from this churchyard sanctuary as they drive by. 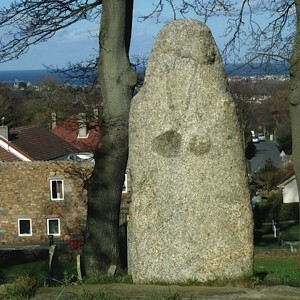 The two metre statue-menhir now stands greeting worshippers at the west entrance to the church that almost certainly replaced a very important Neolithic site. The name of the parish also suggests a fort here but that was much later than the period we are looking at. Rescued from the ground in 1878, she (some say he) was found within the chancel at about equal distance from the north and south walls about a foot below the surface. The statue-menhir (I say she) was lying east-west and turned over on the left side and found damaged according to the proceedings of the Society of Antiquaries Jan 30th 1879 (and reprinted in The Guernsey Magazine 1880). Was she buried to rid the site of its pagan links, or was she added to the fabric of the new Castel church making it easier for the early islanders to convert to the new religion? She was more than likely buried in the sixth century when the first church was built. She was found with her feet facing the east, the same alignment as many passage graves so I can hardly believe that the same people who buried the statue with such reverence could deface it. After all, she had been their goddess for over two thousand years. The damage looks pretty recent to me though thats only my opinion. Was it accidentally chipped off when she was found? Anyway why only chop off one breast? And where are the crosses usually associated with the Christianisation of menhirs? 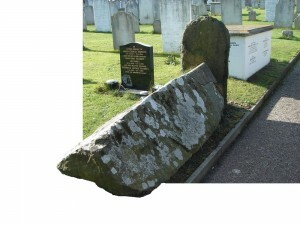 I believe that the damage may have occurred when she was lifted from the chancel floor. Our statue-menhir shares features – breasts, necklace – with freestanding stone statues in northern Africa and the Tresse and other regions of northern France and also those found in Corsica. This suggests that the early people of Guernsey may have shared a common religion with their neighbours of the European continent. I can’t help but wonder if there are any other statue-menhirs waiting to be found. Certainly, most of the parish churches that I have visited have suspiciously large rocks embedded in various walls, not least this one just by the front door. There are actually other huge ancient stones used in the foundations and walls of this church (some bearing crosses) and one giant stone – a possible menhir – makes the cover of a grave just in front of the church to the south. It’s not too difficult to imagine a large open-air temple at the island’s highest point, being seen and being able to see for miles.